Yes, yet another one before the year is out. I found this machine on eBay, but the seller was local, so I was able to see the machine in person before buying it. I offered him $100 less than his asking price, which he accepted, and he ended the auction early on the spot (there had been no bids yet). This machine had been victimized by cheap, un-professional fixes in its lifetime, probably by a coin-op operator trying to keep it earning quarters. And, the guy I bought it from had no idea you were supposed to actually clean the playfield from time to time! I broght it home on Dec 16, 2001. The game was sold to Vince Murray on July 5, 2003. This was one of the most popular games in the eighties (17,000 + units), and in the top five all-time, so it will remain a desireable, collectible machine. 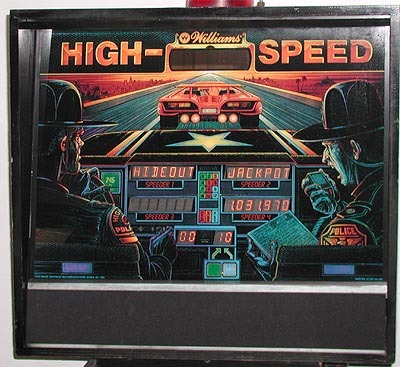 I was originally going to do a full restoration job on this machine, including matching paint and touching up the scratches on the playfield, but there are other issues with it that I would want to address first. 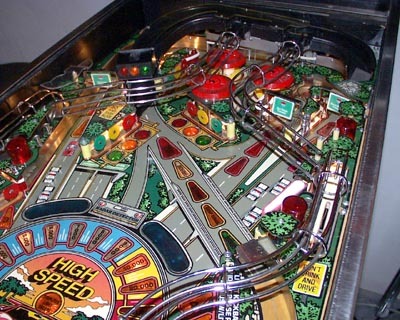 If I can ever find a NOS (new old stock) plastic ramp and a nice set of screened playfield plastics for the machine, then the effort may be worthwhile. But until then, I'll be satisfied with a machine that is working perfectly and is tuned-up well, but needs a little cosmetic work. Backglass and stripped playfield. The backglass looks pretty good in this picture, but there's about a 5" scratch in the middle that doesn't show up here. You can see some of the scratching in the playfield picture on the right; I think someone broke the playfield glass at one time and was not too careful in cleaning up the sharp, broken pieces.. Here are a couple of shots of the playfield after cleaning and re-assembly. I was very relieved that I was able to put everything back together without having any leftover pieces! In fact, I had to dip into my pinball parts box for several screws, nuts, etc. that were missing.. Replaced: flipper bats; bumper bodies, skirts and rod/rings; one fried coil; all rubber pieces; new leg bolts and mounting plates; some plastic playfield pieces; many lamp bulbs; all plastic posts; and I'm sure several other misc pieces. Rebuilt all three flippers. Only the coils and switches are original. Removed the old playfield mylar. 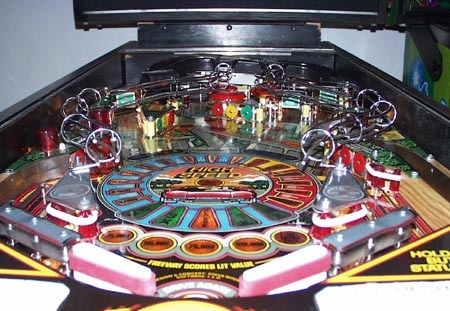 The mylar kept the main portion of the playfield in good shape, but it was quite scratched and discolored from age and use. I won't be needing that kind of playfield protection in a home environment, so I'm not replacing it..
Disassembled and refurbished all three pop bumpers. Replaced a bad transistor on the main CPU board that was causing a coil to fry and a fuse to blow. This was my first attempt at circuit board repair, and it went very well! Replaced a bad connector that was causing problems with the GI (general illumination) lights. 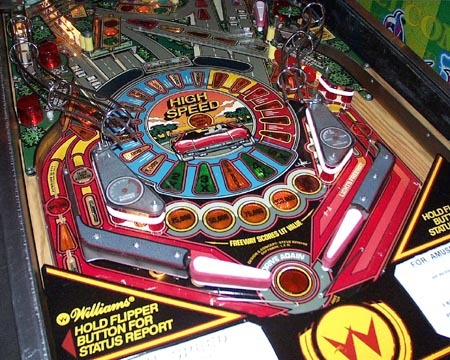 Reproduced four of the playfield plastics. This is the first time I've done this also. They turned out OK, but I'll do better next time! Repaired many cracks on the plastic ramp, and reinforced portions so that they won't crack so easily next time. Repaired and reinforced stoplight assembly above the ramp entrance. Adjusted many of the switches. Some features weren't working at all because of mis-adjusted switches. Removed and polished the lockdown bracket and all ot the legs, as well as some of the stainless steel ball guides. Disassembeld and cleaned the plunger assembly, as well as the start button assembly. They were both filthy, and had overspray paint on them from a previous cabinet touch-up job. COMPLETELY disassembled, cleaned, and reassembled the playfield. It looks nice and bright now! Soon, it will have new speakers as well. 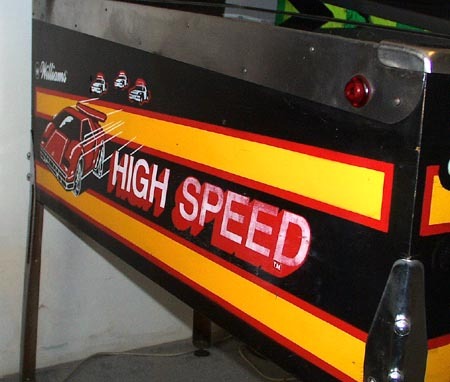 There is a company that specializes in replacement speakers for pinball machines, and the sound should actually be better than when the machine was built! 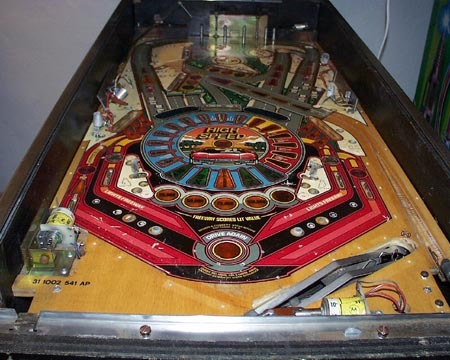 A view of the playfield from behind the flippers, and a shot of the left side of the cabinet. The paint is wearing off the cabinet some, but the cabinet has no major gouges or scratches that are very common among machines that have been operated in bars or arcades. I think this one had been in a bar at some point.